A modern twist on an American classic! California Common is a unique beer style dating back to the days of the California Gold Rush, when brewers on the west coast incorporated caramel malts and additional hop character into their lager beers, helping mask the effects of warmer fermentation owing to a lack of available refrigeration. The resulting beer was a jack-of-all-trades: malty and full-bodied enough for a winter evening, but also hoppy and dry enough for the hottest California afternoon. 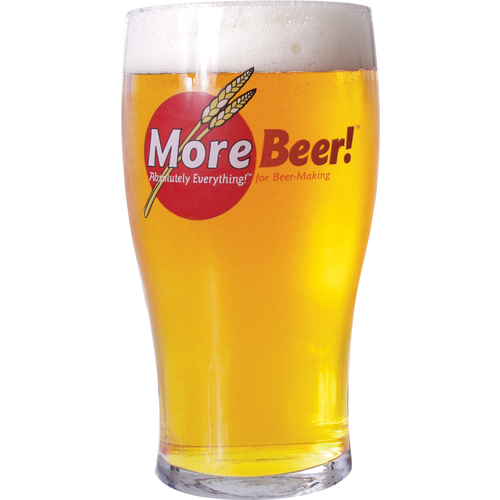 Here at MoreBeer! we love the classics, and Cal Common is no exception. But we’re a long way from 1849 and it’s time to give this classic, nearly forgotten beer style a chance to step into the modern age. To do that, we’ve combined the Northern Brewer hops that typify California Common with the Simcoe hops that are so prevalent in today’s California IPAs, creating our first ever hop blend, “Norcoe.” The resulting beer is still a delicious jack-of-all-trades, but with a hop profile that’s at the same time common, and not Common at all! Wanted to try it, good price. Had great results with this recipe made 5 batches so far and all came out well and very similar to each other. 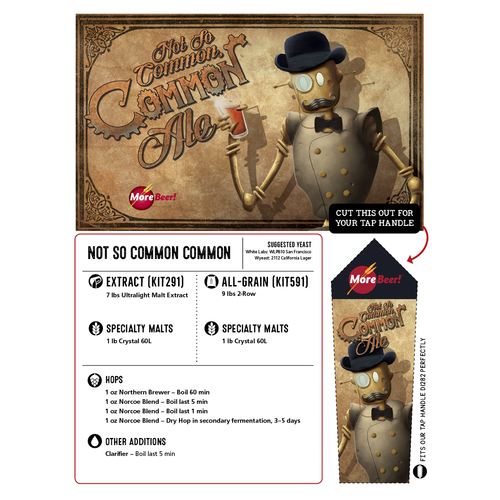 I brewed this Uncommon Common with Wyeast California Lager yeast at a near steady 68 deg and got a third place in a regional home-brew competition. This is an excellent beer and I highly recommend it. It is pleasantly hopped with a nice finish. All around great brew. Perfect as is or add a little something to mix it up! Great beer! everything about this beer I love. It's not overly complicated, has a floral smell and after taste and is very easy to drink. It's not over hopped, and I think most beer drinks will appreciate the hoppy flavor but not be overwealmed by it. This could easily be a house favorite. Great beer, super easy and hard to beat at the price. 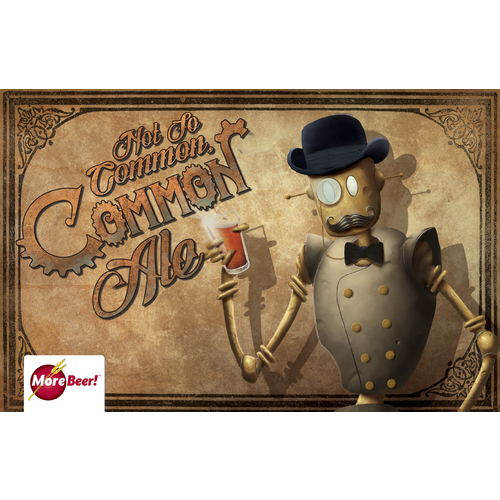 Wonderful mix between a pale ale and a common. Not your father's anchor steam, it's better! 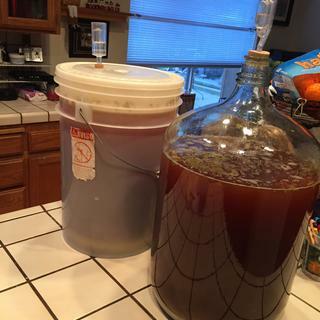 Easy brew day with an extract, and an uncommonly good ale. Dry hopping makes it "hop forward" but the "NorCo" blend is very pleasant. 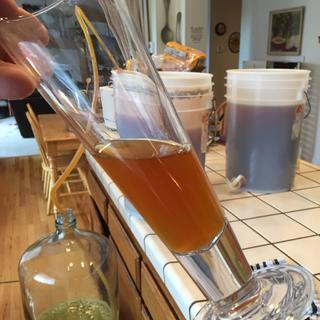 I've brewed a lot of extracts ffom MB and this is by far my favorite. It is in my list to brew again (and again!). Its so much better than I expected. I like Steam beers. I love Simcoe hops. What I liked most was the lack of Carapils or other "head retention/ body builders" in the malt bill (so common in the MB kits why?). This beer is super clear (no finings), the perfect color (its an extract beer and that doesn't detract here as it might in other styles), is super malty and candy sweet on the nose from the 60L, but the Simcoe blend balances and kills it in the aroma/ flavor profile! I accidentally used an ounce of pure Simcoe for the dry hop (instead of the supplied NorCoe) and I couldn't be happier. I hope More Beer plans on stocking their NorCoe blend for some time as it seems key to this beer. It might take some figuring on a custom Northern Brewer/ Simcoe blend on our own, but this kit has inspired me to brew this again and again. I would like to know the AA% (not listed on package) so I could reproduce this excellent brew for many years to come. Ordering the all-grain kit now. i am always looking for a beer with a quick turnaround......i love my milk stouts and my irish..but this is the fastest beer i have ever made....no aging needed, and it is a wonderful beer of hoppy goodness, and its good quick!!!! 10 days of carb and no greeness!!! This is a winner.... Just a plain old fashioned wonderful beer....cheers!! !